Just because an animal has a base-model brain and can't regulate its own body temperature doesn't mean it's unintelligent. Recent news shows two cold-blooded animals, a fish and a lizard, cleverly solving problems--and giving us brainier animals reason to question our superiority. Swimming back from a 60-foot dive in the Great Barrier Reef, a diver "heard a cracking noise" and turned to see a fish exhibiting a surprising behavior. The fish was a black spot tuskfish, also called a green wrasse, and it was holding a cockle in its mouth while hovering just above a rock. While the diver snapped pictures, the fish spent well over a minute rolling its body side to side and whacking the shellfish against the rock's surface. Finally, the shell broke, leaving its inhabitant available for eating. 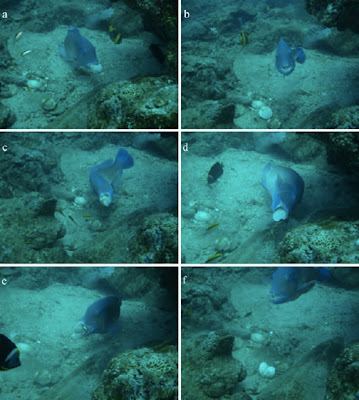 Though there have been reports of fish smashing food against coral or rocks before, no one's documented this behavior in the wild until now. The Australian authors of this paper say that the wrasse's action meets Jane Goodall's definition of tool use: "the use of an external object as a functional extension of mouth or beak, hand or claw." However, Goodall later added* that a tool must be "held." Smashing a shell against a rock (or using the rock as an "anvil," as the authors generously put it) doesn't fit Goodall's definition. Despite a bit of overstatement by the authors, the wrasse's behavior is a not a bad trick for a fish. In another paper, a group of anole lizards demonstrated that they could solve a problem as well as--or better than--birds can. Researchers from Duke University challenged six emerald anole lizards with a find-the-larva task. In each trial, a lizard was presented with a platform holding two wells, inside one of which was a freshly killed larva (mm!). 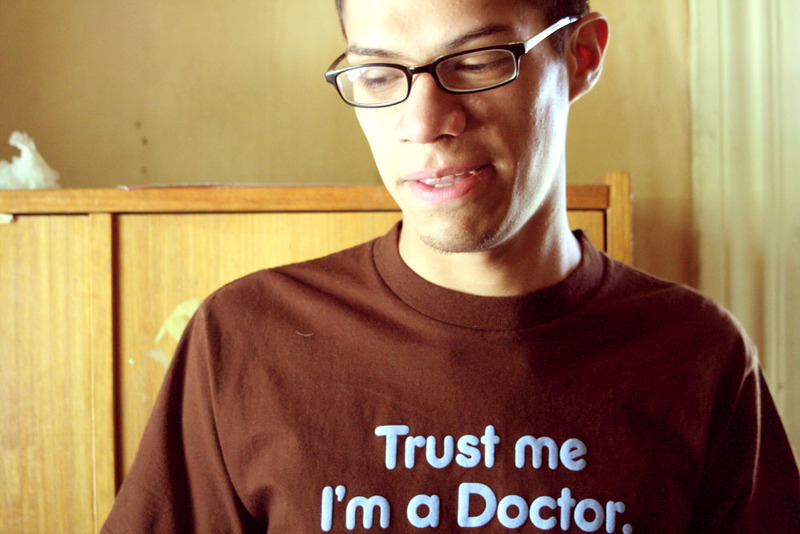 To train the lizards, scientists first put the larvae inside an uncovered well. Then they partially covered the larva-containing well with a blue lid, so the lizards learned that the blue cover was always near a treat. The lizards that passed this challenge were given another one: Now that they knew how to get the lids off the wells, could they choose the right well when given two options? The researchers put the larva under the blue cover and put a similar-looking cover--blue with a yellow outline--on the second well. The lizards weren't fooled, and all repeatedly chose the correct lid to pry off. Finally, the researchers swapped the larvae to the blue-and-yellow wells and gave the lizards six chances to figure it out. Two lizards succeeded, while the other two kept pulling off the blue lid until they gave up. This is impressive, the authors say, because lizards aren't social animals or sly predators that need a lot of brainpower to get by. They catch food by sitting around and waiting for something edible to walk in front of them. 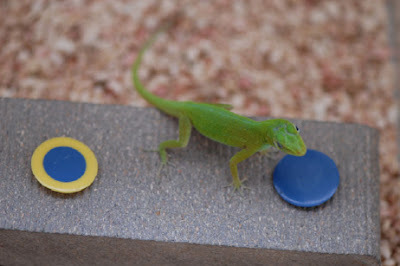 Nevertheless, some of the lizards were able to solve these puzzles. A similar test has been given to birds, the authors say, which are usually thought of as cleverer animals--but the lizards actually needed fewer attempts to pass the test than birds did. It's unlikely that any ectotherms will give us a serious challenge at the top of the cerebral heap, but we might have to expand our definition of animal intelligence to include creatures such as fish and lizards. At least two lizards, anyway. *Source: page 2 of this book, which has a pretty hilariously wrong cover attached to it on Google Books. Every day we find reasons that point to the fact that we hairless apes are not as special and bright as we once thought... Thanks for one more (no sarcasm intended - it is this commenters belief that we need to get over ourselves and learn to appreciate the rest of the living world more).